The Jumping Bulldog in Astoria, carries human grade pet food and treats, organic toys and apparel, supplies and high-end luxury at affordable prices. We provide professional, chemical-free grooming services for your pets in a cage-free environment. We have a one-pet only policy, and we use eco-friendly Earthbath and Isle of Dogs products for your pet’s spa needs. In addition, we offer private boarding, daycare, professional dog training on the premises. Dog walking and veterinary referral services are also available. 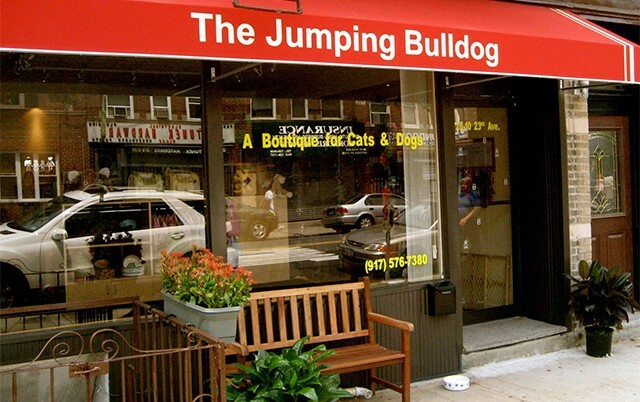 There is no other store quite like the Jumping Bulldog in Astoria... a place where pets rule! If you happen to live in the trendy and happening neighborhood of Astoria, then you don't have to worry or rush around any more. Help is on the way in the person of pet-lover extraordinaire Tania Firrigno and her amazing pet boutique, The Jumping Bulldog. A long-time Astoria resident, Tania left a very successful career in the financial world to follow her heart. Tania's passion for animals and their well-being inspired her to open the Jumping bulldog in 2007. The store carries human grade pet food and treats as well as organic toys and clothing. These are high-end products that are available at fair prices. Services cover just about everything you can think of when it comes to taking care of your pet. Tania offers daycare, dog walking, grooming, pet photography, photography, boarding, aroma therapy and dog massage, a treatment with essential oils that helps to relieve pain and stress. There's always something new happening at the Jumping Bulldog. Tania is proud to welcome Wendy DeSarno and her Good to the bone training program, to the Jumping Bulldog family. A certified pet dog trainer and a member in good standing of the Association of Pet Dog Trainers, Wendy has been employed by the ASPCA as a pet behavioral counselor. At the Bulldog, you can rest assured that your cat or dog will be in a safe, clean and friendly environment. Daycare and boarding are among Tania's most popular options and with good reason. The shop has full ventilation and air conditioning , pet-safe environmentally-friendly paint, a fully fenced in 50-foot dog run and play area, comfortable organic pet beds as well as a fully trained and licensed staff. Spacious kitty condos are also available for your special feline friend. Tania also has an experienced veterinarian on call, for your peace of mind. The owner strongly believes in giving back to the community, donating gently used pet apparel to those pet parents in need. She is also actively involved with pet rescue organizations and, whenever possible, Tania fosters abandoned animals and helps them to find new homes. More than anything else, however, the Jumping Bulldog is about family. Tania is the mom of a cute as a button French bulldog named Oscar as well as two rescue cats, Lexie and Molly. When you shop at the Jumping Bulldog, you are not just a customer. You are a friend and a part of Tania Firrigno's extended family of men, women and kids who treasure their pets. The Jumping Bulldog: what pets want, What pets need.